A 7.3 magnitude earthquake has hit off of the Northeast coast of Japan that caused tsunami warnings in the area. The earthquake triggered small tsunami waves hit Japan’s Miyagi Prefecture. Tensions were high as this was the same area that suffered the worst damage from the massive 9.0-magnitude quake and resulting tsunami in 2011 that left Japan in ruin with death and destruction. UPDATE I: According to reports the tsunami warnings have been canceled. Flash back to 2004 and the Indian Ocean tsunami that devastated Indonesian and left death and destruction in its path. The 8.9 earthquake triggered tsunami killed more than 150,000 people. One of the individuals that was missing, swept away by the waves and thought dead was an 8 year old girl known as Wati. She was only 8 years old when a wall of water crashed through and erased her village of Ujong Baroh in Aceh, one of the hardest hit provinces in Indonesia. The 8 year-old was clinging with her two siblings to their mother Yusinar as they tried to escape the unforgiving waters. The force of the waves proved too strong and Wati was ripped from her family, consumed by the water, never to been seen again. Seven years later according to the Indonesian news agency, Antara, Wati found her way back home to her family. Simply amazing. Initially she was thought to be a homeless beggar when she showed up in the nearby city of Meulaboh. However, Wati’s parents were able to confirm her identify by distinguishing features; a small mole and a scar she got above her eyebrow when she was six. One can only imagine what Wati has been doing the last seven years? President Herbert Hoover, oops Barack Obama leaves Martha’s Vineyard the same way he arrived, on separate planes from his wife and family. As Howie Carr of the Boston Herald says, “Hey, it’s only money, our [the people's] money.”Although Howie said it with a much thickah Boston accent. And so farewell, Barack Obama, don’t let the hatch door of Air Force One hit you on the way out of Massa-tu-setts, as you pronounce it. The first family came in separate planes, and they’re leaving, ditto. Hey, it’s only money, our money. Even before Irene, this wasn’t much of a presidential vacation compared to the earlier ones. An Obama vacation on the Vineyard has been downgraded from Cat 3 to tropical storm. It’s hard to get excited about the arrival, yet again, of the second coming of Herbert Hoover. Of course Obama had to leave the golf course and Martha’s Vineyard early. Not even Obama has the audacity to stay in the lap of luxury while Americans are getting pounded by Hurricane Irene and eight people were confirmed dead. Sadly, the death toll is now at 9. Let alone the hurricane was coming that way which meant his golf game would have been interrupted. The President left the friendly confines of “Life styles of the Rich & Famous to try and act presidential. However, it seems like more of a shameless photo-op. Maybe Barack can use Irene in his next economy speech and blame this hurricane as well for the bad economy.Just like his economic mouth piece did when Austan Goolsbee blamed the bad US economy (VIDEO) on earthquakes, tsunami’s and hurricanes, oh my. You really can’t make this crap up. I’m not making this up. The “earthquake” is causing the double dip. Now that Obama is back in charge and not on vacation, America don’t you feel better? Who can wait for his jobs and economic speech he is supposed to give in September? I know I am on pins and needles, NOT! 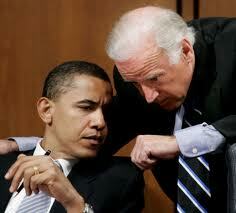 Is it possible that President Obama and VP Biden could actually take their jobs serious? While President Barack Obama plays tourist in Latin America,VP Joe Biden not to be outdone takes time for a photo op and some laughs at NY Yankee Spring Training. UNREAL. Could these two clowns actually take their job serious, especially at a time in which they have committed US troops to yet another military action? Oh that’s right, Obama cancelled his trip to the Mayan Ruins so to appear to look like a leader. Mr. President, would an act of war against Libya be considered a big “F’n” deal? As stated by the Toronto Star, gues happens when Biden shows up to watch a Spring Training game … TOTAL CONFUSION. This seems to be par for the course with any thing done by Obama and Biden these days. That same confusion appears to be the order of the day in Obama’s war in Libya as well. The US along with the “Coalition of the Unwilling” goes to war against Libya in an effort to protect civilians and not target Qaddafi as Obama who wants no part of leading the action tells the world and Libya that we will in no way put boots on the ground. Who tells the enemy what their plans are? From the overwhelmed, over their head, Gang that Couldn’t Shoot Straight … the Middle East in crisis, Japan struggling with fixing nuclear reactors and recovering from an earthquake and tsunami, more terrorist attacks in Israel and the US is now implicated in another military action, this time with Libya and Biden is in FL at a fund raiser for Ben Nelson and off to see the Yankees (VIDEO). Maybe the reason why Biden decided to have some fun and take in a game was because French PM Francois Fillon said we were not at war. Could you imagine what the MSM would be reporting if a Republican President and VP acted like this at such a time of crisis? It is simply frightening that Obama and Biden were elected at this point in time of our county’s history. How out of touch could they be? 2012 cannot come fast enough! As Rome burns, Nero played the violen, the World burns and is in chaos, President Barack Obama managed to take time and do the most important task of the day … fill out his NCAA Mens College Basketball March Madness brackets. Good grief. Far be it from this President actually acting Presidential and getting down to the hard issues of the day like the Middle East in chaos, Japan trying to recover from a massive earthquake and tsunami and trying to prevent a nuclear disaster, the US economy is disarray, Americans still unemployed and gas heading to $4 per gallon. Nope, Obama is lost in smallness and makes sure that he fills out his brackets. How’s that “Hope & Change” treating you America? As stated by Weasel Zippers, in a word … PRIORITIES! Remember when Obama was billed as a different kind of President and and “Outside the beltway” one. All one has to do is look at the fact that Obama picked all four #1 seeds in his brackets to see that was a lie as well. This supposed deep thinking and intellectual president went status quo and went out on a limb and went with Ohio St, Pitt, Duke and Kansas in the Final Four. Wow, Mr. President, Dare to Dream. Some one has to say it, WHAT THE HELL IS WRONG WITH THIS PRESIDENT! Remember when US President used to lead? Obama seems to be incapable. In crisis the world looks to the US for leadership and Obama is filling out March Madness brackets. Can 2012 come fast enough?